If you have pictures showing extreme refraction please submit. The following is the beginning of a collection, the pictures were taken for other reasons than refraction. Comments are added if deemed necessary. Refraction Boost of about 4 degrees! 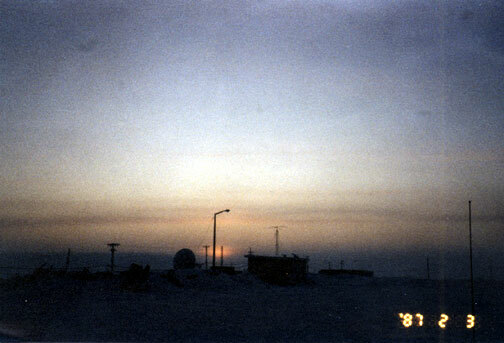 Picture was taken by electronic 35 mm camera mainly for Sky brightness study in relation with stars. 1987 was an extremely cold year, Sea ice completely covering Lancaster Sound broke up in Mid-July, a never to be repeated again phenomena. 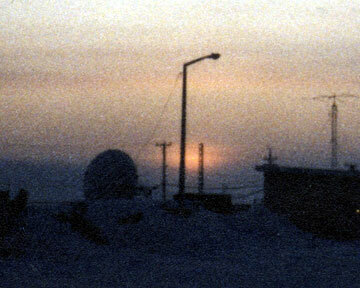 >Resolute February 1, 1987; Sun about -15 degrees under the horizon. A very bright sky given the suns apparent elevation. 1987 was truly cold. Caution; photoprocessing sometimes exagerates brightness. 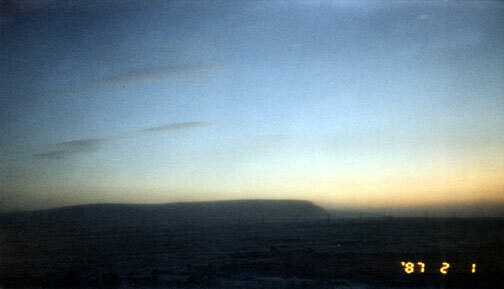 Note: Film processing made this picture darker with the same camera as used in 1987.